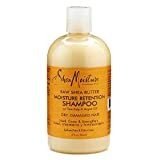 Shea Moisture Raw Shea Butter Moisture Retention Shampoo.Established 1912.W/sea kelp & argan oil.Dry, damaged hair.Heal, grow & strengthen.Sulfate free & color safe. This entry was posted in Organic Health Products and tagged Butter, Moisture, Retention, Shampoo, Shea by Organic Health. Bookmark the permalink.